Carrying around big huge spider this casually, Pauline reached a whole new level of scariness for me. hehe, i think polar bear felt a bit bad after those notes! sounds like a good idea for the My Cardboard Life shop.. I think Polar Bear was just trying to cross Pauline… a good reason for a… Dance-off! So… does Polar Bear just walk around with cute little trinkets, waiting for an opportunity like this? Or did he PLANT the big spider there, anticipating Pauline’s evil deed, waiting for her to try and “get” Colin? There’s a lot more in this comic than meets they eye, I think. 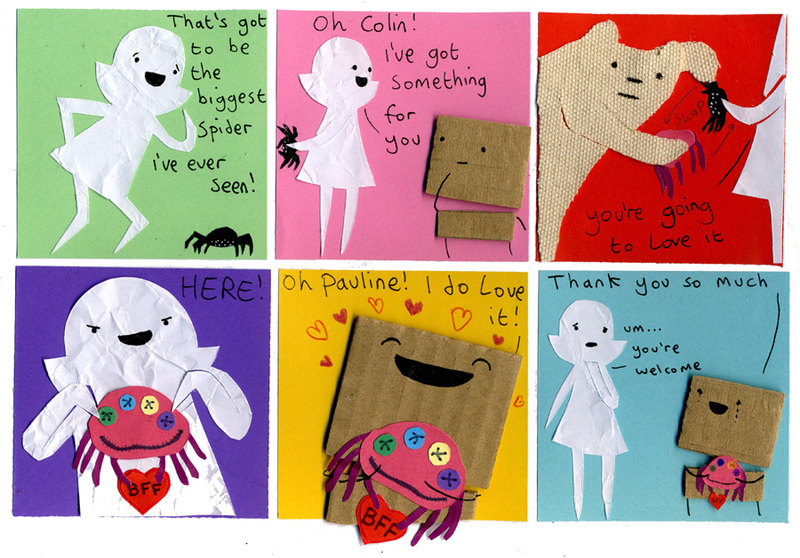 a strip which ends with a happy Colin and a defeated Pauline… my favorite strip yet!!!!!!!!!!!!!!! Is it just me or whenever I navigate to this site, the smell of cardboard fills my nose. I cant say thats a bad smell. Big spider=stomp. It is basic maths Pauline. Weird, I though that pauline would probably step on it ’cause she’s friggin’ EVIL! Paper is immuned to spider venom? Surely bites will still puncture Pauline. I reckon Polar Bear intended to make fun of Pauline more than make Colin feel better. 2 birds with 1 stone. I don’t think we need wonder about Polar Bear’s motives. Got rid of a bit of cuteness? +1! Gained a giant and cool spider? +2! Messing with Pauline & Colin is just icing. I think the Polar Bear has other plans for the real spider! You think the Bear’s gonna eat the spider? So does the bear like him or not?! AWW that is so sweet and… Unexpected? Aww, deep down Polar Bear really does love him! Wait… it doesn’t have a spring with a fist attached in there does it? I would really like to be able to share on tumblr!